Handsome rosewood handle offers a solid grip with gentle contour and comfortable in-hand feel. Bearing flipper pivot and Liner Lock makes the pocket knife easy to open and close with one hand. 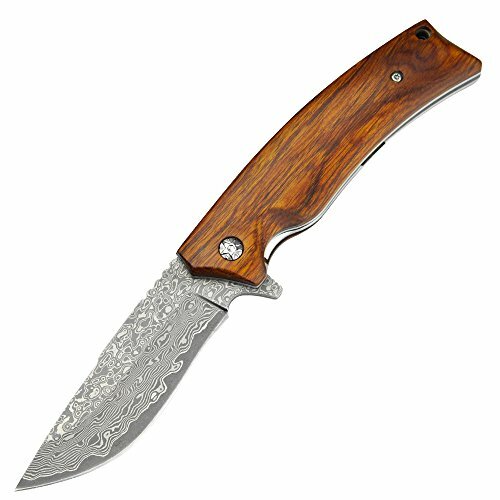 Kubey cultery wood hanle folding poket knives will be enjoyed by both tourists and hunters, hikers and fishermen. Great everyday pocket knife for projects around the house and the outdoors. Best Birthday Gifts for yourself, family members, friends, and business partners. 3：Oil is injected into the axis of rotation. Use some lubricating oil in moderation, If you're not careful to get somewhere else, be sure to wipe it clean and keep it clean for the next time. Kuey offers a diversified lineup of Tactical folding knives, fixed blade knives, hunting camping knife and security items-uitable for beginners and outdoor enthusiasts. We have high quality products and the best price-Enter Kubey Knife Horde LLC outdoorshop, you will find more!